A snapshot from the weather war zone. 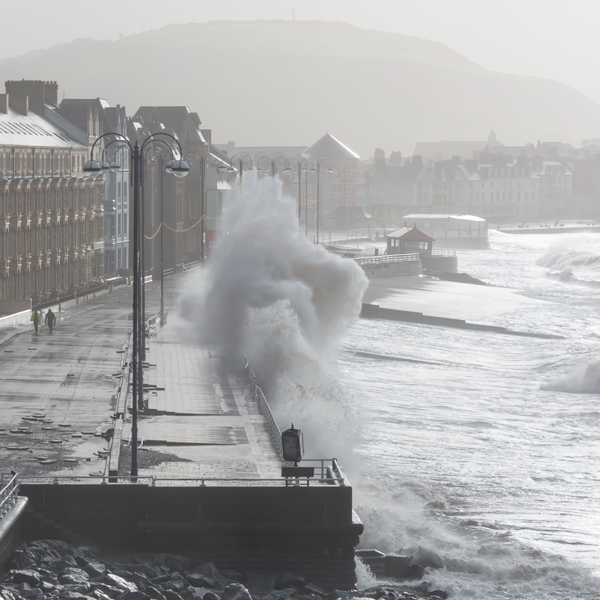 It has been an interesting few days down on the sea-front at Aberystwyth recently, as unusually high spring tides and gale force winds coincided to create some extreme conditions. Last Friday morning a huge swell rolling in from the Atlantic, coupled with a gale from the south-west, produced the first spectacular but damaging high tide. Saturday morning was quite surreal – still a massive swell but the wind had dropped out to virtually nothing. During the afternoon people strolled along the prom amongst the debris as if it were a summer’s day. 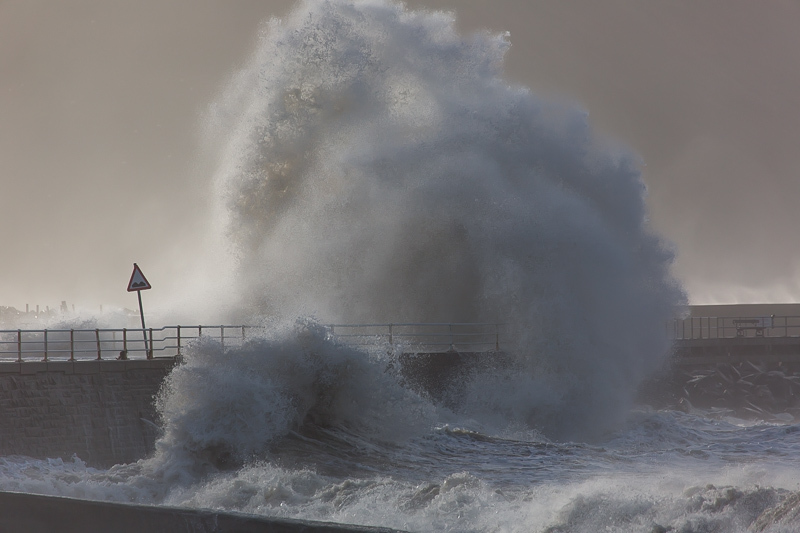 But by Monday, despite a slightly lower tide, the wind was back to gale or severe gale, and boy – did it rain. Aberystwyth has never looked so grim. The local police were out in force by then and access to the promenade was severely restricted. I was told I would be arrested if I walked one stretch of South Parade – on a falling tide – despite the fact that I had already walked it in the opposite direction, quite safely, about half an hour earlier! I eventually realised that the best overall view of the prom would be from an elevated position on Constitution Hill at the northern end, and I was lucky that a brief sunny interval coincided with a rain stoppage while I was there. It’s amazing what a little back-lighting can do! Of course what is spectacular in a visual sense can mean misery for those directly affected. 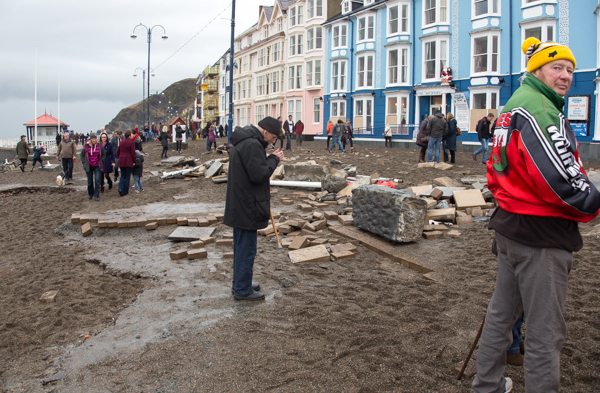 As far as I’m aware no-one suffered serious damage at Aberystwyth but the prom itself looked like a war zone. Railings, benches, paving slabs and the like uprooted and flung around, and the “beach” moved about ten yards inland as far as the front of the hotels…..! The most obvious casualty was a seaside shelter which slowly subsided after the brick and concrete structure supporting it was washed away over a period of four days and nights. On a broader scale the gravel pits and RSPB visitor facilities at Snettisham (Norfolk) which I enthused about in earlier posts were very seriously “re-arranged” in the North Sea storm surge earlier in December, and other coastal reserves have, unfortunately, also been badly damaged. Inevitably there’s now much talk about “rebuilding coastal defences” and/or “managed retreat” in this era of global warming. We know that sea levels have fluctuated naturally and widely over the past few thousand years but even this hard-won knowledge is just a snapshot in geological terms. Looked at with this perspective our civilisation really is built on shifting sands. This entry was posted in Uncategorized and tagged aberystwyth, global warning, high tide, high tides, sea level rise, storm, storms. Bookmark the permalink. 2 Responses to A snapshot from the weather war zone. Been following it on the bbc website, recalling days as an Aber student.Not sure it was ever bad enough to demolish the bandstand. Great pics though ………. nearly came over to take some myself. I think one of the things that made these storms so destructive was that it happened over and over again (twice a day) over a period of four days. Having said that some pictures were shown on the telly of storm damage from 1938, which appeared far worse, especially at the north end of the prom. Perhaps the sea defences were built up to a higher standard following that. I like the diary you and Glennie have produced!